I often joke, when a bad game based on an existing entertainment license is released, that all any property needs to do to create a successful video game tie-in is to paste its characters and concepts over an already-proven title. Doctor Who: Legacy is almost proof of that. In the popular free-to-play mobile game Puzzle & Dragons, players embark on episodic quests, battling powerful enemies in puzzle-based combat with their party of color-coded monster companions. 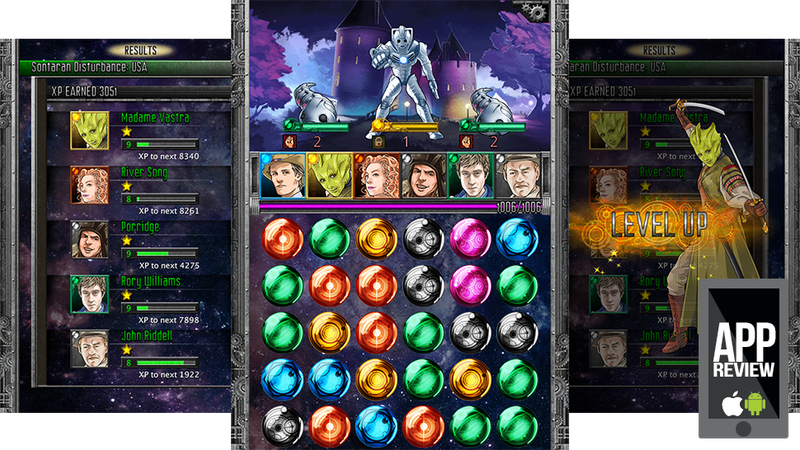 In Doctor Who: Legacy, players embark on a series of episodic adventures, battling powerful enemies in puzzle-based combat with their party of color-coded collectible companions. Yes, Doctor Who: Legacy is an unabashed clone. Tiny Rebel Games and the BBC have taken one of the most original shows on television and transformed it into an incredibly unoriginal video game. The situation would be quite unfortunate, if it didn't work so well. What's basically happening here, story-wise, is the 11th Doctor, Matt Smith, is reliving the events of the 7th and 6th seasons of the television show through a Puzzle & Dragons-esque game. Something about time vortexes or whatever — it's all very wibbly-wobbly, timey-wimey. Instead of colorful monsters, he collects companions along the way, some of which I suppose would qualify as colorful monsters. As fans of the show can see, the Doctor's traveling companions aren't limited to actual companions. One-offs and recurring characters can join the crew as well, offering their own special skills to the puzzle battle mix. New companions arrive as mission rewards, the rare random drop, or they can be spun for via a machine fueled by time crystals either purchased or found sporadically throughout the game. The game isn't limited to Smith, either. David Tennant's 10th Doctor is here as well, and with the plan being to travel backward through Doctor Who history, I wouldn't be surprised if all however many there are now will show up in the game eventually. I love a good puzzle-based battle system. I like this one, but there are some serious tweaks that need to be made before I'll love it. The difficulty ebbs and flows rather than steadily rising — I was nearly put off the game by the difficulty of The Silence early in the game, only to find the next few missions breezed by. The random tough bits make it seem like this is a game where players have to purchase upgrades in order to win, which is a real shame. The drop rate of companion characters feels off as well — I've played through the level where there's a chance to earn the Sontaran nurse Strax at least 20 times, with no sign of him. Items used to rank up the Doctor rarely appear. There's no on-screen indicator of how close characters in your party are to activating their special powers. And overall the game feels a bit unpolished and rough — the retina screen on my iPad Mini is not flexing all the muscles it could. Still, it's early days for a Doctor Who game that plans on delivering regular updates for years to come. Up the resolution, tweak the drop rates and difficulty balance, and we could have a winner here. We'll call Doctor Who: Legacy a good start. It's Puzzle & Dragons with a Doctor Who paint job, but there isn't much out there that wouldn't look good with a nice, thick coat of Time Lord goodness.